The international competition of graduation theses for undergraduates, Master’s and PhD students, organized by the scientific organization Professional Science, took place in Nizhny Novgorod on January 10. 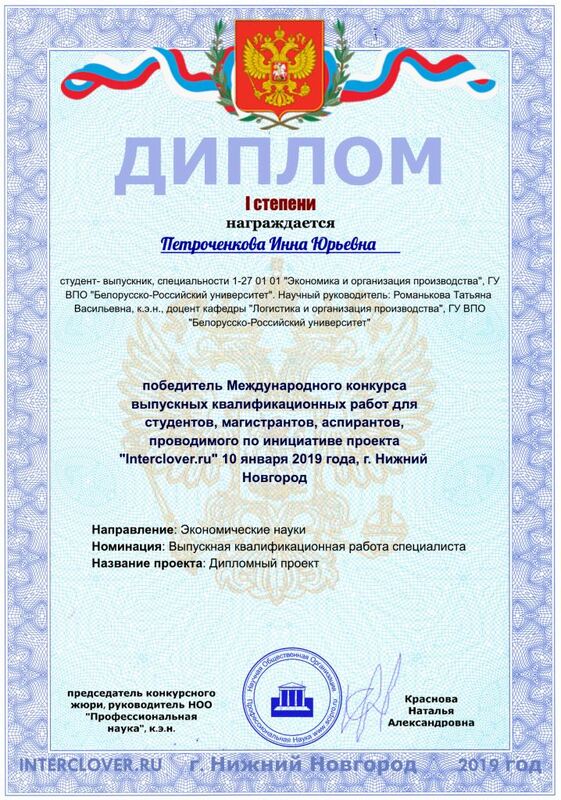 The first degree certificate was awarded to Inna Yurievna Petrochenkova, a graduate student with a major in 1-27 01 01 ‘Economics and Organization of Production’ (EOP-131 group) for her thesis ‘Ways to Improve Construction Enterprise Operations (case study of Mobile Mechanical Department No. 266 of Krugloye)’ prepared under the supervision of Tatiana Vasilievna Romankova, an associate professor of the Department of Logistics and Production Organization, PhD in Economics, Associate Professor. We congratulate Inna Petrochenkova and Tatiana Vasilievna Romankova on winning the competition and wish them continued success in their future scientific endeavors!